The Division of University Advancement at Louisiana Tech has released, “Yesterday. Today. Tomorrow. Forever.,” the 2012 edition of its annual Tech Report, which highlights academic and research achievements at the university during the past year as well as the contributions it has made to strengthening the region and the state. 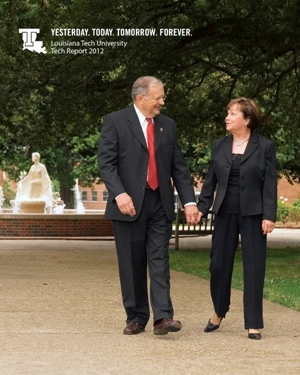 In addition to an institutional overview, this year’s Tech Report provides a retrospective look at Louisiana Tech University President Dan Reneau’s 50-year plus relationship – as a student, faculty members and administrator – with the university and his many contributions to the growth and distinction of the institution. Reneau will retire on June 30, 2013 after serving 26 years as Louisiana Tech’s president. “This year’s Tech Report features a retrospective view of the past 25 years of incredible progress the University has experienced under the unparalleled leadership of President Dan Reneau,” said Corre Stegall, vice president for University Advancement. “The publication highlights the ongoing projects and programs that have established Tech as a national research university, and it also gives a preview of some of the exciting plans for the future. The loyalty and support of Tech’s alumni and friends have provided that edge of excellence that distinguishes the University. “Yesterday. Today. Tomorrow. Forever.” showcases the university and its achievements, the contributions and impacts of its people, its performance as an institution of higher learning, and its service to the state. It offers a comprehensive look at another highly successful and productive, yet challenging year for Louisiana Tech. Special to the 2012 edition, a timeline of Reneau’s personal and professional achievements throughout his time at Louisiana Tech stretches from cover to cover. From a chemical engineering student in 1960 to an assistant professor in 1967 to vice president of academic affairs in 1980 to being selected as the 13th president in 1987, Reneau’s remarkable journey is chronicled and shared with friends and supporters. “For over 50 years, Louisiana Tech has served as the centerpiece of our lives and a great source of pride and passion for our family,” said Reneau. “All that Louisiana Tech has been able to accomplish over the years is a direct result of the commitment and contributions of its people – the faculty, staff, student, alums, and supporters that make our university a very special place. Despite continued budget reductions and the growing uncertainty surrounding the state’s future plans for higher education, “Yesterday. Today. Tomorrow. Forever.” shows how Louisiana Tech continued to focus on institutional performance, earning another Tier One “National University” ranking in US News & World Report’s 2013 Best Colleges, a ranking as one of the nation’s Top 100 Best Values in Public Colleges by Kiplinger, and recognition from Newsweek as one of the nation’s 25 Most Affordable Colleges. In 2012, Louisiana Tech continued to have the University of Louisiana System’s highest graduation rate, highest retention rate, highest average freshman ACT score, and the state’s fastest time-to-degree completion for first-time baccalaureates. The strength of its students and graduates helped Louisiana Tech to earn a No. 1 ranking among Louisiana’s public and private universities in starting salaries for recent graduates, according to PayScale.com’s 2012-2013 College Salary Report. In addition to institutional rankings and achievements, “Yesterday. Today. Tomorrow. Forever.” highlights the excellence of Louisiana Tech’s student body, new academic programs, campus construction and enhancements, impacts through community service and improvement projects, and educational outreach activities. With an eye to the future, “Yesterday. Today. Tomorrow. Forever.” also looks at the growth of research and innovation, opportunities for engaging and mentoring the next generation of Louisiana Tech students, and showcasing student-led initiatives, entrepreneurship and productivity. “Yesterday. Today. Tomorrow. Forever.” is made possible through the support of the Louisiana Tech University Foundation. For more information, please contact them at (318) 255-7950 or go to http://www.latechalumni.org.